Diamond Extrusion for Consistency of Internal Finish. 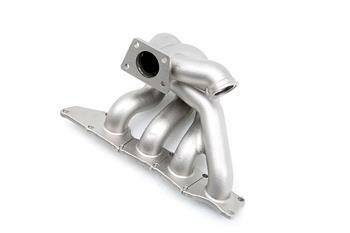 The manifold fits Precision turbo sizes 5558 up to 6766. We started doing the design work on this manifold in 2007. We first started with extensive CMM data from the stock engine bay area (to determine constraints in the design), and the stock manifold to make sure we could replicate the cylinder head flange exactly. With this data, we knew where we could route the runners, and we were able to keep the stock turbo geometry / placement. With this, if you choose to run our manifold with a stock turbo and internal wastegate, you will be able to with no problems. Though it has been a long wait for this exhaust manifold, cp-e™ chose the path of producing a casting for its durability and to achieve an equal length manifold at an affordable price. CFD analysis was used to help create this manifold, to make it as efficient as possible. The manifold is very versatile and allows end users to go from a stock turbo to a stock replacement turbo or even to a radical v-band turbo.